UPS batteries have a finite working life and at some stage during the lifetime of your uninterruptible power supply the battery set will require replacements. The actual working life is dependent upon a number of factors. It is important when selecting a UPS system to ask what the design life of the batteries fitted is. Typically small UPS below 20-30kVA are fitted with 5-year design life batteries and larger systems ten-year design life batteries. Design life is a calculated term and is dependent upon the number of charge/discharge cycles the batteries are subjected to during their working life and also the ambient environment. The ideal ambient temperature for a UPS battery is 20-25degrees Centigrade. It is important to remember that for every 1 degree rise above 30, battery design life halves. How Often Do I need UPS Replacement Batteries and What Is Overall Battery Life? The longer the life expectancy of the UPS batteries, the longer the time between a UPS Replacement Battery is needed. However, design life is a calculated figure and batteries rarely reach their design life. In fact, in a critical power installation you really want to look to replace the batteries before they reach end-of-life to maintain resilience. For this reason a good rule-of-thumb is to look to fit UPS replacement batteries as follows. In a 5-year life battery this is around years 3-5 and for a battery life (design) of ten-years, around years 7-8. Now your UPS will include battery set monitoring as part of its test and check algorithms but the only way to identify what is actually happening with each individual battery block is battery cell monitoring or the use of a hand-held battery tester. The latter is the preferred route for many sites and a "UPS battery testing service::http://www.ecopowersupplies.com/eco-services/ups-battery-testing-service is often an add-on that can be provided as part of a UPS preventative maintenance visit. At EcoPowerSupplies we provide a complete UPS battery replacement service. This includes a number of elements. We provide a free site survey when asked to look at replacing UPS batteries. This allows us to approach the task as a project. On-site we can inspect the UPS and battery-set and identify the necessary work required to achieve replacement and bring the uninterruptible power supply back on-line. Where required we produce a project plan and a site specific Risk Assessments and Method Statement (RAMs) if required. We source batteries from all the major battery manufacturers and have yet to find a battery that we cannot replace. Sometimes the UPS batteries may be in cartridges (popular with APC UPS systems). Here the solution is to provide a complete UPS battery replacement kit and cartridge or to replace the batteries inside the cartridge on site. Sometimes this is not always possible, if the batteries show signs of heat damage and are swollen tight into the cartridge. For other UPS systems the on-site battery solution uses battery cabinets or a battery stand. In either of these it is again fairly easy to identify the battery make and Ampere-hour (Ah) size and DC voltage and provide equivalent replacements. As part of our UPS replacement batteries service we also provide a complete and documented removals and recycling service. EcoPowerSupplies is a licensed waste carrier with the Environmental Agency. When we remove batteries from site we are alleviating the site of responsibility for the batteries and provide a Waste Transfer Note. The replaced UPS batteries are taken to our recycling centre where they are stripped into their components: plastic, lead plates, hydrochloric acid electrolyte and so forth, for recycling. We also provide a disposal and recycling certificate for the batteries at the end of this process. UPS battery testing as a service is growing in its acceptance as a value-added service. The cost of hand-held battery testers has fallen and they have become far more sophisticated in terms of tests and functionality. A good hand-held battery tester will cost around £2-3k. As well as being able to store results and perhaps push them to a Cloud-based database for analysis, battery testers can also typically now provide one or more of the following test functions: impedance, conduction and/or sulfation. Impedance testing lets you know when a battery has failed. Conduction testing informs you as to the overall health of the battery. Sulfation is linked to impedance and battery aging and again is a measure of battery health. The batteries within most uninterruptible power supplies use Valve-Regulated Lead Acid (VRLA) technology and are supplied as maintenance-free. Wet cells on the other hand may require a little more maintenance in terms of adjusting electrolyte levels within the batteries themselves. For any battery set it is important to visually inspect them at least once a year. Battery cases for VRLA batteries tend to be plastic and plastic will buckle under heat and the level of heat generated by a battery with a high impedance. Buckled battery cases are a sure sign of a failed battery. UPS battery testing is a service that can be applied at least once a year. Generally, the use of hand-held battery testers means that UPS engineers (or battery engineers) can inspect several hundred batteries in a day. Prices for replacement UPS batteries can vary. Often the largest cost within any UPS battery replacement project is labour. 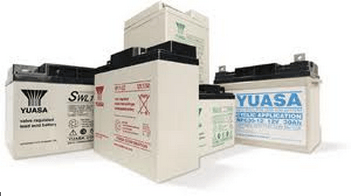 Most UPS battery replacement companies should offer a rebate or discount based on the materials they can recover through recycling of the reclaimed batteries. Remember that UPS batteries tend to be sealed lead acid batteries and lead has a fairly high recycling value. UPS companies like EcoPowerSupplies offer UPS replacement batteries as well as kits and cartridges on-line. Clients can order from the website and then return their old UPS batteries to EcoPowerSupplies for recycling. This process tends to take place for smaller plug-and-play UPS systems. Sometimes for the smallest UPS, it may actually be cheaper and less hassle to purchase a new UPS system, complete with a new warranty. Alternatively, individual batteries and battery sets can be purchased and our engineers can attend site to fit them. This is the most common approach for larger UPS systems including hardwired single and three-phase UPS. The batteries within your UPS system should be considered a consumable item and their replacement planned for. The newly installed set will be covered by the battery manufacturer’s warranty and should help to extend the overall working life of your UPS system. As a final note, remember that a UPS typically should last around ten years without a major overhaul. If your UPS is around 8-10 years old it may be time to look at fan and capacitor replacement or consider an upgrade to the latest energy saving equivalent UPS system.